According to the UN World Population prospects, by 2050 there will be more over 65s than under 15s and the quickest growing age category will be the over 80s. Across the developed world, strategies are being developed to address the future challenges this will bring to society. Prime amongst these is empowering and enabling people to continue to live independent and fulfilling lives well into old age. Design has a huge role to play. From a wayfinding perspective not only do we need to consider issues around mobility and accessibility, but the less visible cognitive impairments such as Dementia and Alzheimer’s Disease, which bring about a different set of requirements. Professor Andrea Tales, Chair in Neuropsychology & Dementia Research and College Dementia Research Lead, Swansea University. Lucy Richards, Founder & Creative Director, StudioLR in Edinburgh, studied Visual Communication at Edinburgh College of Art and qualified with BAHons and Master of Design degree in 1990. In 2004 she founded StudioLR – a company committed to considering how design makes people feel. Their ambition is to cut through complexity and noise to connect with people and create experiences that improve everyday lives. Lucy will discuss the results of joint research project with the Universities of Edinburgh and Stirling that looked at signage in dementia care environments. 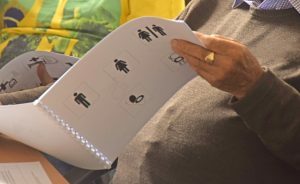 The outcome has been the development of a new set of inclusive symbols – designed to empower and enable independence for those living with dementia. Clear, unambiguous and easy to understand, StudioLR see these new inclusive symbols as being appropriate for all. Professor Andrea Tales, as well as being Chair in Neuropsychology & Dementia Research at Swansea University is also Director of the Dementia Research Group and Senior Editor of the Journal of Alzheimer’s Disease. If this is your first SDS talk/event, you can pay a special ‘taster fee’ of £10 payable on the door.